I am so sorry about the lighting but if I get the sketches in too much light you can't see them and you don't get the true expression. I like this girl but her one pupil is too large and I don't care for her hair but hey, you always try different things in sketching and learn from them. And each one I do is a learning process. 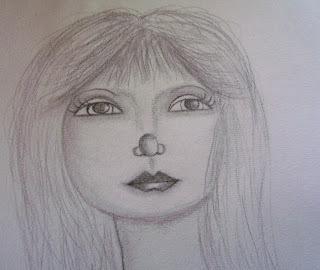 I think her lips are pretty good and her nose is a bit knobby but she looks like she is thinking about something. Anyways, a short posty here. Thanks for dropping by and Day 6 is my next post...so stay tuned.